A quick note on the notion of valves and pipelines that can be configured in File (and FTP) Adapter Services and References (inbound and outbound) to perform file pre- and post processing on the files before they enter the composite application proper as XML or after they have left the composite application, turned from XML to their native format and before they are written out to file. Valves can easily be created – in a way that reminds me of Servlet Filters – and the pipeline that can be configured with a chain of valves is also quite similar to a filter chain. A valve is custom Java Class that implements one or two specific interfaces. This class is packaged in a JAR file that is added to the classpath of the SOA Suite: the valve becomes part of the generic SOA Suite infrastructure, to be used potentially by multiple composite applications – not necessarily by just a single composite. Note however that use of a valve is configured in the File Adapter binding in every composite application that wants to leverage it. For outbound post-processing, a similar list could be composed. Currently valves are not supported by JMS or Database Adapter – only for file and ftp. I have an inkling that this may change in the fairly near future, though this is only guesswork. Note: it feels to me that some of the things valves can do regarding file and ftp adapter bindings, we can do through custom web service policies for web service and http binding – message pre- and post processing for inbound and outbound bindings respectively. For my own reference – and who knows whom else may find this useful – I will describe the simplest example of implementing and leveraging a valve for the file adapter. The first part is creating and deploying the custom valve, the second is configuring a pipeline with the valve in a regular composite application. Both parts are very straightforward. In the Application Navigator, right-click the project. Select Project Properties. The Project Properties dialog is displayed.Click Libraries and Classpath. Click Add Jar/Directory. The Add Archive or Directory dialog is displayed. Browse to select the bpm-infra.jar file. Click OK. The bpm-infra.jar file is listed under Classpath Entries. 3. Create the Java Class that is the custom valve. This class should implement the interface Valve or StagedValve or – to make life easier – you can simply extend from AbstractValve. The Valve that I have created below is extremely simple: it received the contents of the file as read by the file adapter and potentially pre-processed by other valves earlier in the pipeline. It copies the content to an outputstream and returns an inputstream based on that outputstream. Meanwhile it writes the contents of the file to the console. However: it does not change anything, it does not validate anything: it is pretty useless as it stands. However, it would be very easy to start adding real functionality to it, as you can hopefully tell from looking at it. In order for the SOA Suite to recognize the valve class, you need to (re)start the server after adding the JAR-file. This completes part one. The valve was created and deployed and sits not ready and waiting for composite applications that want to make use of it. 1. Create a new Composite Application (or take an existing one). Add an inbound File Adapter binding to it if it does not already contain one. 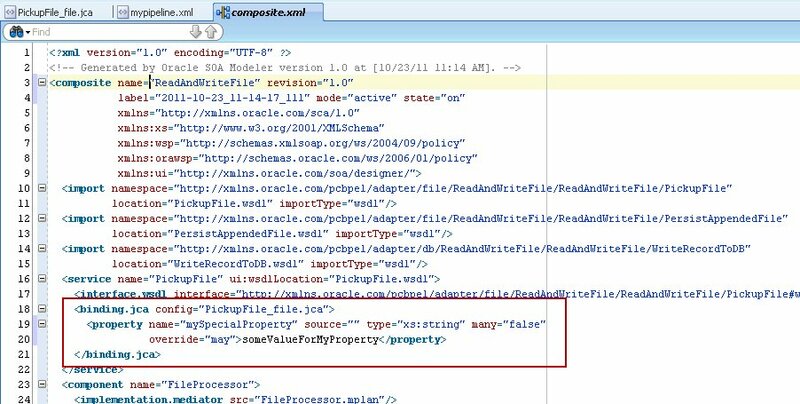 The reference mypipeline.xml indicates a file called mypipeline.xml that is located in the same directory as the jca file itself. 3. Create the file mypipeline.xml with the valve(s) that are clustered together in a pipeline, for use in File and FTP adapter bindings. The file contains one or more valve elements – in the order in which they should be invoked. 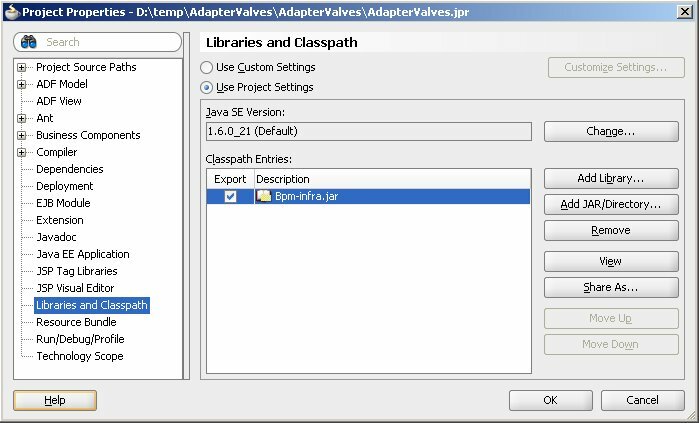 A valve element contains a fully qualified Java class name – that refers to a class that implements the Valve interface and is available on the classpath of the SOA Suite run time environment. 4. optionally: the valve can read properties that are set on the specific File Adapter binding that it is invoked for. Before deploying the composite application, or during deployment (using a configuration plan) or even after deployment (through the Enterprise Manager Fusion Middleware Control), these properties can be defined and modified, thus impacting the behavior of the Valve – if that is the effect the property has inside the valve. <property name="mySpecialProperty" source="" type="xs:string" many="false"
5. Deploy the Composite application and activate, for example by copying a file to the directory that an inbound file adapter is polling from. Note that not only is the content of the file that was processed reported (and realize that it could have been manipulated by the valve), the output also demonstrates how the valve identified the value of the property that was set on the file adapter binding. This could have guided the valve in its behavior for the particular circumstances of this composite application. Question: I have followed your instructions to a T and I am not having the output that I am looking for. I am using the ReentrantUnzipValve which extends the AbstractStagedValve – as I am trying to unzip a zip folder which contains multiple files and extract the contents of the zip folder to a different location by using and read and write file adapter. I am using file adapters because I need to poll a specific directory for said zip folder and after the Java class unzips and stages files in staging area I am trying to specify a location with the write adapter for these files to reside (which is a different location than where the read adapter is polling from). One issue I am having is in the write adapter it wants me to specify a file pattern name – which in this case I don’t really have one because I am polling for a zip in the read adapter and when I write with write adapter it would no longer be a zip … inevitably I would expect it to turn the zip into a regular folder (as one would expect when files are extracted from a zipped folder) and a regular folder does NOT have a file extension type – and .dir doesn’t really work here so … does anyone know what I am doing wrong or a better way to approach this???? I am getting the following error message when I deploy the class file in PART 1 to generate a JAR file. This load was initiated at default.composite.ReadlResourceRoleExcel.soa_cf2a49d3-d6f1-4415-8658-d1fa25077fc0:1.0 using the Class.forName() method. Yes, you do have to bounce the JVM in order for changes to be picked up. Nice blog. Do you have to bounce the SOA server to take the java changes effect?